This is a 100% Chardonnay wine from Sundance Vineyard in the Wahluke AVA and raised in stainless steel. The nose is bright and light with aromas of lemon, pear, mint and lot of stoniness. It is full and fleshy on the palate, ending with very crisp and focused acidity. It lingers with pretty fruit and again, great stoniness. This wine has fabulous complexity and completeness. All this for $20?! Awesome! 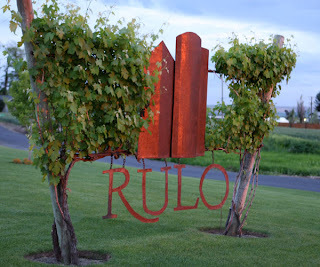 A great showcase of the high quality of wines coming from Rulo. Kurt & Vicki Schlicker began Rulo Winery in 2000 in Walla Walla. Kurt is the winemaker & the two of them run the show together - tasting room operations, cleaning, tasting, blending, selling, delivering, the whole gamut. They make Rosé, Viognier, Chardonnay, Syrah and Cabernet all at great prices. These guys make arguably the best $20 red wine in the world in that Syrah they make.